Cindy I can do forecasts like that. They have cancelled church 3 out of the last 7 Sun. One of them it snowed all day but the other 2 it was slick in the morning but ok later in the day. Its raining here today but probably going to be messy when it moves your way. Judy sounds like you have your next few projects lined out. I bet the little girl will be tickled with a turtle. Mary taco soup and corn bread sounds good. Dh says its time to think about picking up another big bag of sunflower seeds. Collette on those shawls and lapghans. Mona have a safe trip. Hope all goes well with the treatments. Also making a Sweet Pea blanket for the toddler using leftovers from her aunt aly's blanket....she has her eye on Aly's! We are back home having been around the roller coaster several times in the last week. DH had major problems with his anemia this weekend (5 units of blood in 4 days) which resulted in the cancer dr deciding to cancel the intensive chemo and go with conservative instead . There are good points and bad to each option, and in the end it is what it is and we just have to go on from there. It's been a very hectic, rather overwhelming week. I just applied chocolate to the situation and now I think it's time to shut down the brain and play a game on my kindle. Its mostly been cloudy and raining the past few days but the sun broke thru for a bit yesterday afternoon and we finally hit 60° for the first time since back in Oct. Today its cloudy with the wind howling away. Cooking dh's corn beef. Think I will let it cool so I can slice it and fix the cabbage, carrots, potatoes, and cornbread tomorrow. Been working on hot pads. 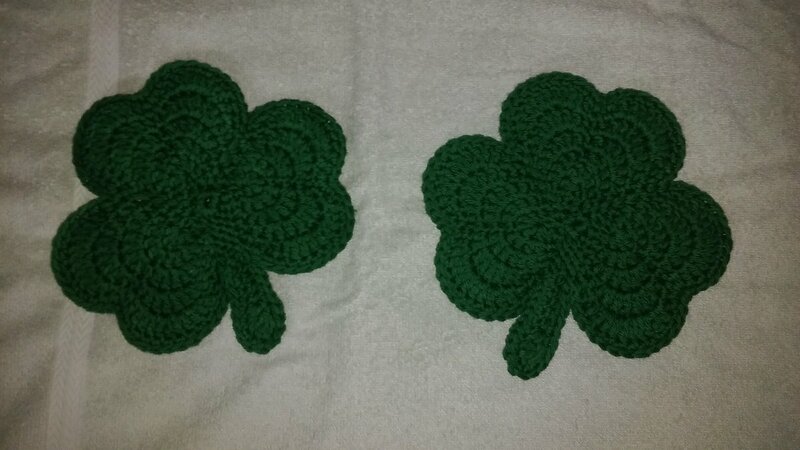 Shamrocks for sis and niece and very large round one for nieces kitchen table with glass in the very center. Good evening, friends. Our days have been crazy and mother nature brought us power outages and severe weather yesterday. We're so fortunate to have no major damage and we can deal with the rest. Mona ~ Sending big hugs and saying prayers for you both. Please know that we're here for you! Have a good evening House. Hi ladies. Not a lot going on here. The sun is shining here, and there are even some birds singing. Hopefully this marks the end of winter! Nice projects Judy and Brenda. Thinking of you and your hubby, Mona. Mary, the weather sure has delivered some tough blows lately hope things are back to normal for you. I went back back to work this weekend and ended up working both days at another hospital in the same company. (Only critical care nurses float between hospitals.). It’s a lot lower key at that hospital than my usual work place. It was actually a really good weekend. I havent done much crafting lately, although I did get out my scrap blanket last night. What I really want is to start a new project. I have enough stash to do that, but my WIPs are out of control. I need to finish a few things. It’s a good thing I’m not crafting out of necessity! Hope you are all all doing well. What I really want is to start a new project. I have enough stash to do that, but my WIPs are out of control. I need to finish a few things. It’s a good thing I’m not crafting out of necessity! I can really relate to WIPS being out of control!!!!! I went through only 10 of my bags of yarn and miscellaneous today--and MOST of them were more UFOs than yarn!!! I really need to get this under control!!!! Judy cute little ghan. Are you getting more winter weather? Cindy and Collette you are not alone in the ufo department. Mona how is dh ? 50° and sunshine here today but the wind made it a bit chilly. Beautiful weather here this week! Too bad we spent most of it in a hospital room. DH's hemoglobin tanked again. He swallowed the camera Thursday (capsule endoscopy) so hopefully we'll hear something back from the GI dr Monday. It's past time to find his blood leak and get it resolved. Chemo has been put on hold until it is. Hope everyone is getting a break in the weather. Spring is definitely here with lots of stuff blooming in the yard. I was sitting outside in the sun with Lucy, reading, just a bit ago. Officially 56 outside but in the sun it felt a lot warmer. Cindy - what sort of new project will you be making?? I finally finished the christening blanket yesterday - it's basically a giant granny square but I alternated between the traditional GS and rows of the closed - made a nice design. I just have to embroider a cross on it and add one to the three blankets my elderly friend dropped off. Counting me, there are now 6 people working on this project - thank goodness! I've enclosed a close up of the border I added to it. And the Spoke flower blanket pattern (on revelry) is what I've been making lately. Lots of vivid colors - by request - and i've basically been deciding on the color arrangement as I go. I think, based on DH's reaction, I've hit the jackpot on this one. A photo outside will be necessary for this one when it's finished! Judy beautiful blanket. I am glad you showed the whole thing as I kept looking and looking at the photo you posted Sun looking for the solid rows. The border is gorgeous. Glad spring finally made it to your area. We are actually having many nights where it is staying above freezing. Mona hope they get dh stabilized and back home soon. Cant decide if I have a headcold or allergies. Most likely its a combination of the two. With the warmer weather the trees are popping pollen and things are greening up. Good Morning! I'm still here...just been a crazy couple of weeks. I don't seem to multi-task as well as I used to. Mona ~ Sending more hugs and positive thoughts to you all. Judy ~ Lucy looks so happy! Your afghans are gorgeous...you've been very busy. We're still waiting on our April appointments with our new primary doctor since our doctor retired in December. They are renewing prescriptions, thank goodness. Meanwhile, I've taken DH to a walk in clinic for a terrible cold and cough and was very impressed with them. The doctors are MDs and they take Medicare and supplemental. They can also be our primary doctors...something to think about! Hi ladies. Nothing much happening here. (That’s a good thing!). Even the weather has been normal. Mona, ,hope they have found dh’s blood leak. Mary, I just had to switch my PCP as well. My old one moved his office about 50 miles away. I don’t want to drive that far. Hello to all in the house! Judy, I love the blanket! The solid rows give it a completely different look. Brenda, hope you're feeling better. Mary, hope DH is better. I can definitely relate to not being able to multitask like in the past. Pretty weather here this week. Working on taxes, so I haven't been out in it as much as I would like to. DH is feeling ok so far this week. Still waiting on the endoscopy results, apt with oncologist tomorrow. I've gotten in some crochet time to counterbalance the tax time. Not a bad week, just feel like we're circling in a holding pattern. Life is good.... opening day for the Yankees, the sun is shining and I'm plugging away on the Spoke Flower, which is nearly done. Judy great photo of you in your jersey all ready for the season opener. Opening day for KC ----cloudy, windy, rain delay, and beloved catcher Salvador Perez out for entire season. Poor dh. Me I am looking forward to football. 'Morning all. It's cloudy and cool with storms coming tonight and tomorrow...spring time in Texas! Mona ~ Waiting for results is so hard. Thank you for keeping us informed - we're all thinking of you! I'm so glad you're able to squeeze in some crochet time. Cindy ~ Yay for normalcy! I really think it's time for you to start a new project. How is your mother in law? Judy ~ The afghan is so pretty with such happy colors! Love seeing your beautiful smile and your Yankee's shirt! Brenda ~ I hope everything is okay where you are. Are you close to any of the flooding? No issues were located on DH's endoscopy, so starting next week Tuesdays will be our oncology day for the next three months. Now to get the tax stuff finished and delivered to the cpa on Monday and I'll feel like I can breathe again. Good weekend wishes to everyone! Hi Mona! Good news about the endoscopy. Will you be able to have the Tuesday appointments close to home...fingers crossed. I hope everyone is having a good weekend. Looking forward to some crochet time tomorrow.